Dr. Maggie Sullivan is a heartbeat away from a breakdown. As a successful neurosurgeon, she is accustomed to high pressure situations. Within a twelve-month period, she has survived a practice-destroying scandal for which she bore no responsibility, a wrongful-death law suit, and a miscarriage that left her devastated. When the ER doctor with whom she has been in a relationship for two years dumps her because her emotional needs are more than he can handle, it is the proverbial last straw. Maggie desperately needs a break from all that her life in Denver has become. Sullivan’s Crossing was Maggie’s home for the first six years of her life and it is where her father, refusing to consider retirement, still runs the general store and campground that his father and his father’s father had run. It has been Maggie’s refuge in the past, and it is the place she instinctively heads for in her current crisis. However, she doesn’t find life at the Crossings as peaceful as she expects. The day after her arrival, her father has a heart attack, and she spends the next weeks back in Denver, first in the hospital where Sully has heart surgery and then in her home where she cares for him during the rehabilitative stage. Both Maggie and Sully are relieved when they can return to Sullivan’s Crossing. Maggie shares her father’s gratitude for the friends who have filled in at the store and campgrounds during Sully’s absence, but her gratitude to the mysterious Cal Jones is mixed with suspicion. He may not be a serial killer, but he is not the typical hiker killing time until the weather clears for him to hit the Continental Divide Trail. Cal insists on helping despite Maggie’s suspicions, and he soon wins her over. Friendship comes first, but it soon grows into a love that makes the feelings Maggie had for the man who was briefly her husband and the unlamented ER doctor anemic in comparison. But Cal is still haunted by his own tragedies, and not even his love for Maggie deters him from completing his soul-searching journey. Can Maggie trust him when he promises to return to her? Robyn Carr does her usual superb job of creating a world that captures her reader’s interest and affection in this first book in the Sullivan’s Crossing series. Like Grace Valley, Virgin River, and Thunder Point, this new setting is warm and welcoming and peopled with engaging characters. Maggie and Caleb are complex characters, far enough past their youth to have fascinating layers, but the secondary characters are also deftly drawn. Sully is a wonderful character, but Frank and Enid, Tom Canady and his brood, even Andrew, the jerky ex, add to the story. The location of Sullivan’s Crossing in the Rocky Mountains, at the convergence of the Colorado and Continental Divide Trails, is clearly symbolic as Maggie and Caleb are at a crossroads in their own lives. It will be interesting to see if the theme saturates this first book only or if it plays out through the series. The novel also felt as much women’s fiction as romance to me. Although the romantic element is strong—and I really liked Caleb--Maggie is the heart of the book. Despite a diligent search, I have been unable to find what is next in this series. (I’m hoping for Tom’s story.) I am also unclear on whether the Thunder Point series is complete. 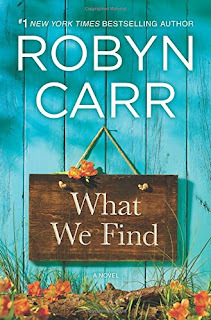 I do know that the next books from Carr are Swept Away (July 26, 2016), a reissue of Runaway Mistress (2005), and The Life She Wants (September 27, 2016), a new novel which sounds like standalone women’s fiction. Sullivan’s Crossing is this author’s first hardcover release, and it is one fans of her Virgin River and Thunder Point books will not want to miss. Even if it didn’t give me that intuitive conviction that I had just read a career-defining book as my first reading of Virgin River did, it is a good read—an addictive one—and I definitely recommend it to readers who enjoy small-town romance or women’s fiction/romance hybrids. Hey, it’s a Robyn Carr! That speaks for itself. I love Robyn Carr. This is on my list to read. I have a couple of more commitments then I will pick this up. What we Find was great. Very likable characters. Thanks for lmk that Swept Away is a reissue. Love Robyn's work.